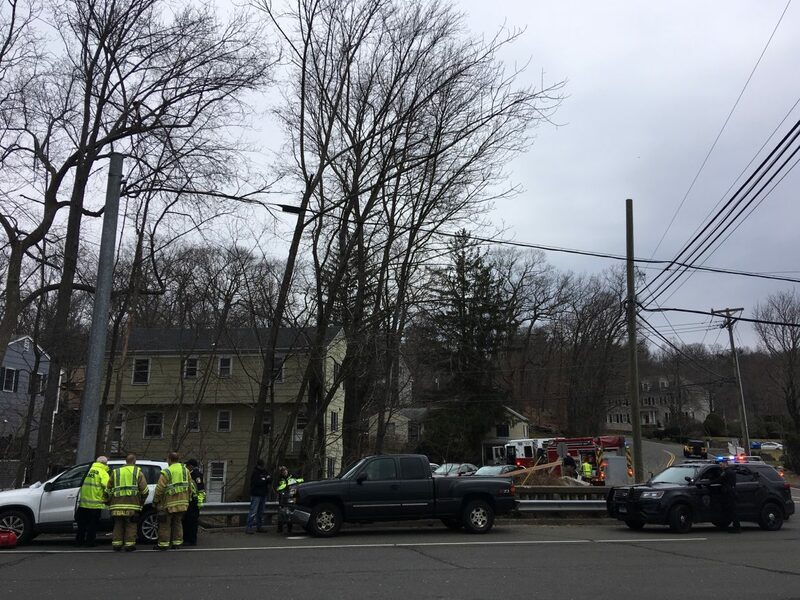 A woman rear-ended while waiting to turn left off of Route 123 near downtown New Canaan was transported to Norwalk Hospital Monday morning, officials said. At about 11:29 a.m., police, fire and medical services personnel responded to the intersection of New Norwalk Road and Locust Avenue on a report of a car crash with injuries. There, officials found that a man driving a black pickup truck traveling northbound on Route 123 had rear-ended a woman in a white SUV as she waited to turn left onto Locust Avenue. Members of the New Canaan Police Department, New Canaan Fire Department and New Canaan Emergency Medical Services—formerly known as the Volunteer Ambulance Corps—responded to the scene. A puddle of liquid from one of the vehicles involved in the crash could be seen in the middle of the intersection. EMS personnel attended to a woman who wore a neck brace as they guided her toward an ambulance. The extent of her injuries was not immediately known. The vehicles did not appear to suffer much damage. Officials at the scene said the man would be cited for following too closely, an infraction. Traffic slowed near the busy intersection as larger cars in the northbound lane were forced onto the centerline to get around emergency vehicles parked on the side of the state road.